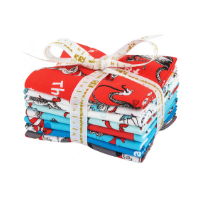 Everyone loves fat quarters! Whether you're working on a fat quarter-friendly project or just building your stash, Feline Drive is the place to find what you need, with fat quarters from over 1,000 different cat prints in stock. We also carry hundreds of fat quarters in other non-cat fabrics that are great for coordinating with your cat fabrics.